On their homepage, Dragon Models, Ltd. has announced that figures based on characters from Benny Chan’s Shaolin (2011) are “coming soon” to toy stores, presumably in Hong Kong and Mainland China. Since I live in the currently snow-covered town of Ann Arbor, MI, I’ll have to rely on my friends overseas to keep me informed of the actual release date. 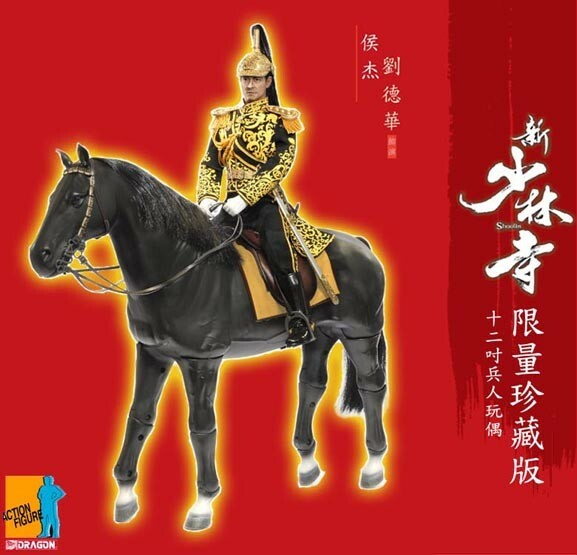 In the near future, toy collectors can look forward to ponying up some serious dough for super-detailed figures of warlord-turned-Shaolin monk Huo Jie (Andy Lau), Cao Man (Nicholas Tse), Wudao (Jackie Chan), Jing Neng (Wu Jing), Jing Kong (Xing Yu), and Suo Xiang-Tu (Hung Yan Yan). Two of these figures even come with horses to play with, so I suppose when you’re tired of re-enacting your favorite scenes from the movie, Andy and Nic can take Barbie and Skipper for a ride. Click on the thumbnails below to get a slightly better look at all the figures in the proposed series.